Thousands of children will soon take to the streets for a night of trick-or-treating and fun. 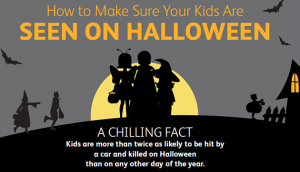 However, Halloween is also one of the most dangerous nights of the year for these young pedestrians, given an increase in drunk drivers on the roads, frequently poor street lighting, and costumes which may restrict visibility or maneuverability. Avoid costumes with excessive flowing fabric, such as capes or sleeves. Loose clothing can brush up against a jack-o’-lantern or open flame. Oversized costumes can cause trips and falls. If possible, choose a brightly colored costume that drivers can spot easily. If not, decorate the costume with reflective tape and stickers. Glow sticks and flashlights are also good accessories. Choose face paint and makeup whenever possible instead of masks, which can obstruct vision. If a mask is worn, be certain it fits securely and cut the eye holes large. Inspect the treats. Toss anything tampered with or that has loose wrappers or doesn’t seem right. Also toss anything homemade — unless you know the person who gave it to your child and can be sure it’s safe. Always supervise children under the age of 13. Older children should trick-or-treat in a group, and a curfew should be established. Older kids should go in a group — never alone. Create a route ahead of time. Walk slowly. Be mindful about cars, making eye contact with drivers. Always walk on sidewalks and cross at crosswalks or traffic signals. If there are no sidewalks, then walk facing traffic and way to the left. Tell your child to go only to well-lit houses and remain on the porch within street view. Make sure your child understands never to cross between parked cars and to look both ways before crossing. Drivers should back out slowly, keeping a watchful eye on children and knowing that high times for trick-or-treating are from 5:30-9:30 p.m. No distracted driving. We Fight for Victims of Impaired Drivers and Pedestrian Accidents in Georgia…Contact us Now for a Free Consultation. The Murray Law Firm has recovered millions of dollars for victims of pedestrian accidents in Georgia. We represent our Clients on a contingency agreement, which generally means that no fees or payments are owed until and unless we recover. Anyone seeking further information or legal representation is encouraged to contact us at 888.842.1616. Consultations are free and confidential.